Researchers at the Georgia Institute of Technology have developed the first device to directly measure complex ultrashort light pulses in space and time at and near the focus of the pulses. Knowing how light is distorted allows researchers to correct for the aberrations by changing a lens or manipulating the pulse into the desired form. Since lasers that emit ultrashort pulses of light are used for numerous applications, including micromachining, microscopy, laser eye surgery, spectroscopy, and controlling chemical reactions, the new device may greatly contribute to advances in these fields. Until recently, the light pulse has always measured immediately as it exited the laser. Researchers did not realize the extent to which the light was distorted by the time it reached the focus point, after traveling through the optics and lenses in the system. Because the pulses typically last a few thousandths of a second and are faster than the response time of the fastest electronic devices, it was extremely difficult to measure them. The light, which comes out as a train of extremely short bursts, creates intense laser pulses. 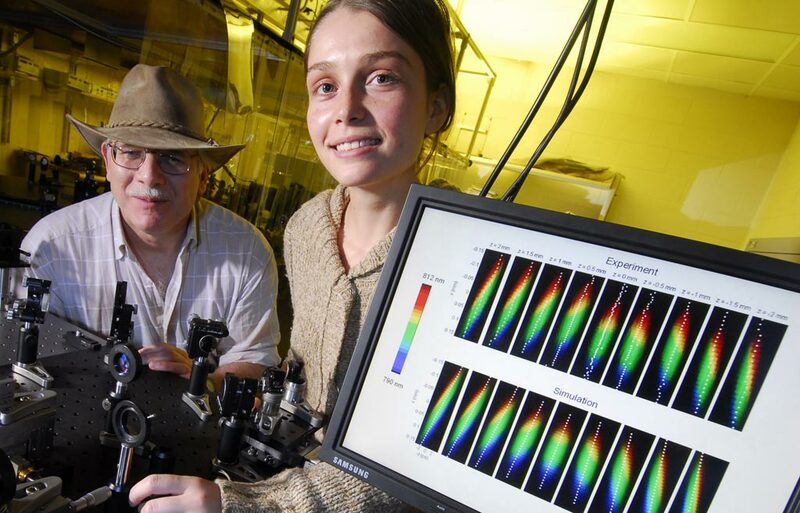 A new device, called the SEA TADPOLE (Spatial Encoded Arrangement for Temporal Analysis by Dispersing a Pair of Light E-fields), has been developed to allow researchers to measure ultrashort light pulses simultaneously in space and time as they go through the focus. The laser pulses enters the SEA TADPOLE through optical fibers, which only collect a very small portion of the light. Therefore, the device naturally measures pulses with high spatial resolution and can measure them at a focus spot that is smaller than a micron. Using specialized fibers the GIT researchers were able to further improve the spatial resolution of the device. The device was tested by measuring ultrashort pulses focused by various lenses, since each lens can cause different complex distortions. Since aberrations can drastically increase the pulse length, which in turn causes a decrease in intensity, the SEA TADPOLE system tells researchers what types of aberrations are present. Using this data, scientists can eliminate the affect of distortions by testing different lenses in the instrumentation or creating the desired pulse at the focus. TFOT recently covered the world’s shortest single photon pulse containing just one photon, which was produced by Oxford University scientists. TFOT also reported on the research and development of the dual distributed Bragg reflector (DBR) grating semiconductor laser. More information about the SEA TADPOLE can be found on the Georgia Institute of Technology website.